These extraordinary shot glasses have the finely veined, translucent appearance of rose quartz, but actually are carved from the finest quality, food grade Himalayan pink salt. These glasses naturally add the perfect nuanced, salty note to your favorite tequila. No need for messy table salt, just serve with lime wedges for a bite of citrus tartness. Very cool glasses that up the style quotient of your Tequila shots. Carved from pure food-grade Himalayan pink salt, they have the translucent beauty of rose quartz while adding a perfectly nuanced note of salt to your favorite Tequila. The kind of shots that make a party, there's no need to fool with salting rims, just add a wedge of lime and you're off. It's best to take the shots fairly quickly because the longer they sit, the more salt they absorb. Unlike table salt, Himalayan crystal salt doesn't dissolve so your glasses are in for the long run. Simply wipe clean between shots and the anti-bacterial nature of the salt will take care of the rest. Thoroughly satisfying, try them with a short Bloody Mary [virgin or otherwise] too. These glasses naturally add the perfect nuanced, salty note to your favorite tequila. No need for messy table salt, just serve with lime wedges for a bite of citrus tartness. Do the glasses eventually disintegrate? How long does the salt last? Yes they do disintegrate in time, it will take close to 100 shots if you wipe them dry after each shot before they will have any issues. The manufacturers website advises how to clean the glasses; wash by hand under running water, no soaking or dishwasher. There isn't any indication as to how long they will last other than " The shot glasses will be a perfect addition to many parties to come." This hints at the eventuality that the glasses might melt away over time. HI do these shot glasses have a plastic cup inside? 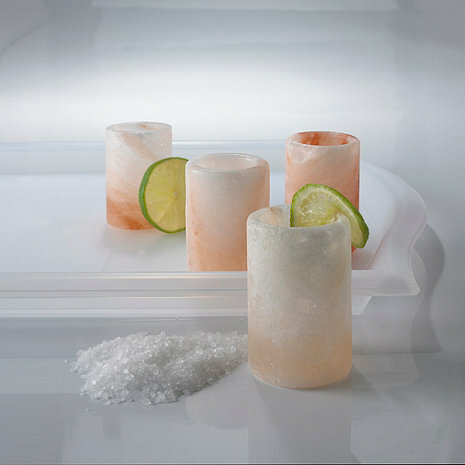 BEST ANSWER: The Himalayan Salt Shot Glasses (Set of 4) do not have a plastic insert. These glasses naturally add the perfect nuanced, salty note to your favorite tequila. BEST ANSWER: I gave them to my son and daughter in-law for Christmas and they love those glasses. They use them for Tequila shots and I get to enjoy tequila shots with them over the Holidays. Very easy to care for. In fact my son wants another set. That was the only size available when I purchased my gift. BEST ANSWER: Hello Susan, the glasses are 3" tall with a diameter of 1". We received these as a gift and they are a great addition to our bar. The salt has a good taste and they are super easy to clean since because they are made of salt you just need to wipe them out after using and stand upside down to dry. I would recommended these for anyone who enjoys tequilla. Saw this and it made a great gift for those who love good tequilla. Problem is that if you don't drink the shot quickly the natural salt overwhelms the flavor of the drink... So Drink FAST! LOL! Look great and makes good conversation. We received these as a gift and all I can say is I wish I had found these before Christmas so I could have given them as a gift. I am not usually a fan of doing the salt with tequila so I wasn't sure how I would like taking a shot out of them, but they are downright fabulous. The Himalayan salt adds just the right amount of saltiness to the shot of tequila. They make a wonderful muffled clink when toasting before a shot (similar to how ceramic poker chips sound). We love them, and anyone who drinks tequila will appreciate these as a gift. These were a great gift for my husband who drinks tequila - he loved them! However, I ordered 2 sets - 2 cups were broken when they arrived. The company was great about sending a replacement set immediately. Unfortunately, 3 were broken in that set. The company needs to better check the product before it ships and find a better way of packaging the product so it arrives unbroken. Glasses came full of cracks so don't look stable to use as shot glasses. They stay sweaty in humidity so are very salty to actually drink out of. More a novelty item..